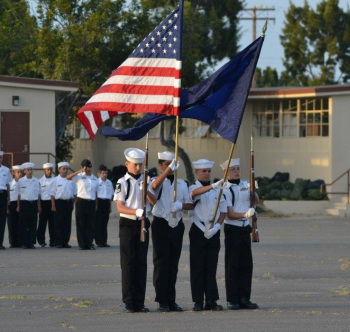 Founded in 2011, we are one of the newest Sea Cadet units in the region. We belong to the Pacfic Southwest Region 11, District 3. Escondido Battalion is named after the city in which the unit is based and in honor of Escondido community members, groups and businesses who were instrumental in the formation of the unit. Training Ship Kit Carson is named after Christopher (Kit) Carson, the famous scout who guided Captain John C. Fremont over the Sierra Nevada Mountains during a government exploration expedition and in 1846 fought in the Battle of San Pasqual just outside of Escondido. Our units draw from the northeast San Diego County communities of Escondido, San Marcos, Ramona, Valley Center, and Fallbrook, in addition to the South Riverside County cities of Temecula and Murrieta. We drill every 2nd and 4th Saturday of the month through the school year with breaks during the summer and winter months to allow for training camps. Our drills take place at the California Army National Guard Armory located at 304 E. Park Ave, Escondido, CA 92025. Currently we have about 25 Cadets enrolled and we continue to recruit and welcome interested young persons and adult volunteers. If you you would like to attend an orientation to learn more and witness a drill "in action" contact us via the How to Join link above. A Recruiting Officer will contact you to set up the orientation. At the orientation, the Commanding Officer (CO) will provide information about the USNSCC and can answer any questions you may have. After the orientation, you have the option to join us for the day before making a commitment. What is the difference between the NSCC and the NLCC? The NAVAL SEA CADET CORPS (NSCC) is for young Americans who are at least 13 years old. They may stay a Sea Cadet until December 31st of the year they turn 18, or until graduation from High School. The NAVY LEAGUE CADET CORPS (NLCC) is for young Americans who are least 11 (10 with approval and waiver) but not yet 14 years old. The NLCC is basically the same as the NSCC except that NLCC Cadets wear different uniforms and are restricted from flying aboard US Navy aircraft, participating in long shipboard cruises and other hazardous activities and are taught from a syllabus rather than correspondence courses. However, general training during drills will almost always be the same for both units as both units drill together. Visit the Cadet/Officer FAQS page of our website for additional information.